Rahul Dravid: No..... Not again please! 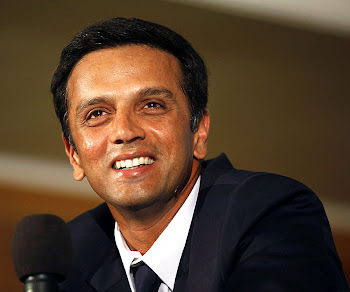 It has been a long-long-long....... wait to see Rahul Dravid batting and finally the moment arrives. You see The Wall of India walking in and you just leave all your work aside to stick to the television set. He stays on the wicket for good 60+ minutes and all of a sudden he runs himself out. Yes, "Rahul Dravid run out 18 (34 balls) " is what pops-up on TV . After watching this, my head demands a bucket of water to be poured on it. And why not? Getting run-out in a test match is something unacceptable, especially for someone like Rahul Dravid. Poor remote controller gets banged on the floor, TV is turned off and you go back to the work. End of the story? No. You forgive your hero and hope that he plays well in the 2nd innings. Next day, India are handed a follow-on and Gambhir gets out in the 1st over. 0/1 is the score , not an ideal situation for any player to enter in. In comes Rahul Dravid and starts off with his rock-solid defense. Srilankans test him with outside the offstump line without any success. On the other hand, Sehwag throws his wicket away and Rahul gets joined by Sachin. Both these legends once again prove why they have scored 10k+ runs in the test format. No risks taken, no unnecessary chases for the ball, not a single ball hit in the air - and you know that this pair is all set to save Team India. Both of them play out 40+ overs to add 119 runs to the teams total. And now comes another dissapointment - Rahul flicks one straight into the hands of leg gully. A delievery that deserved a place outside the boundary gets placed safely into Sangakkara's hands. Srilankans know they have got a huge wicket and Dravid walks back in frustration. Sachin follows him to the pavillion in the very next over and you know it's all over for Team India. Team India loses Dravid, Sachin and Yuvraj in last 6 overs to put themselves in a danger of losing the match by an innings. This ends today's story. Team India has it's last batting pair left (Laxman and Dhoni). It's just a matter of interest to see if Team India can save themselves from embarrassing defeat or not! An article about Dravid and Kumble....from 2006.
rahul dravid is a good player in india team.he is a good striker player.so he called wall.